This recipe came about when we were having guests and I pulled a pork loin roast (well, actually two small pork roasts) out of the freezer and then challenged myself to make something with the ingredients I had on had. I love to cook this way, I discover the best taste combinations and have built up a repertoire of dishes I come back to time and again. This is just such a dish. As a bonus, it is inexpensive (when the pork is on sale especially), it is easy, and you can marinate the pork before putting it into the freezer if you choose to! Combine 2 tablespoons of olive oil, the rice wine vinegar, soy sauce, sesame oil, garlic, onion and ginger. Whisk briskly until combined. Pour half the marinade over the pork roast in a bag. Reserve the other half of the marinade. 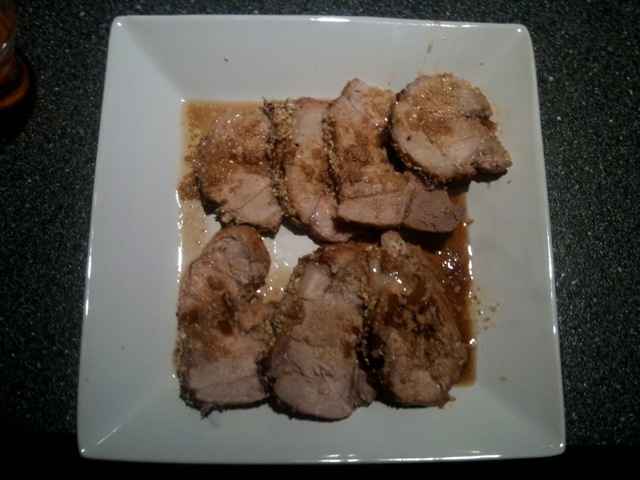 Massage the marinade into the pork and leave to marinate at least one hour or up to 24 hours. Remove the pork from the fridge about one hour before cooking. Preheat oven to 325 degrees Fahrenheit. Heat 1 tablespoon of vegetable oil into a large frying pan on high heat. Remove the roast from the marinade. Discard excess marinade. Sear the pork on all sides (about 2 minutes per side). Place into a roasting pan. Pour the reserved marinade over the pork. 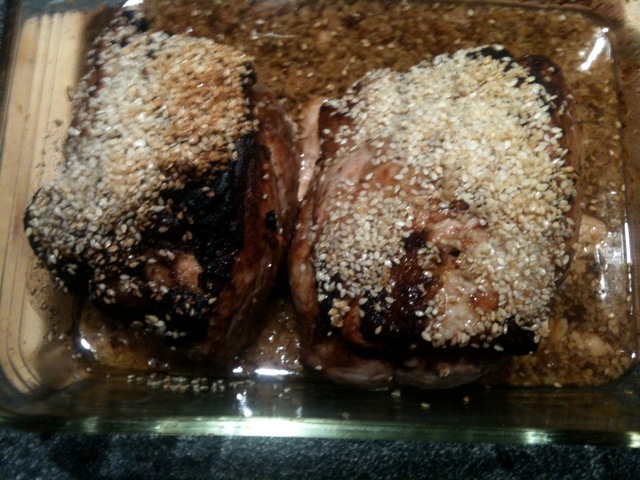 Sprinkle with the sesame seeds and put the roast into the oven. Roast for about 25 minutes per pound or 55 minutes per kilogram until the internal temperature reaches 160 degrees Fahrenheit. 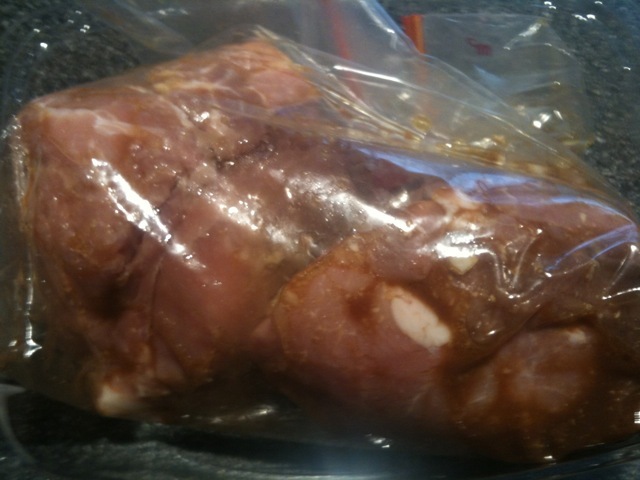 You can also freeze the pork in the marinade, preferably in a freezer zipper bag. Freeze the reserved portion of the marinade in a smaller freezer zipper bag and put both bags into a larger one, label and freeze. When ready to cook, defrost and continue as usual. Frugal Tip: You already know about buying meat in bulk when it is on sale. This tip does you one better than that: When I find pork (or other meat on sale, I buy several, make different marinades and freeze the pork in the marinade. Then, I have meals, ready to roast and for a really great price. Because I am not the greatest at following through on my good intentions, when I see that meat is on sale, I sometimes make it even easier to get the meat processed when I get home. I get the bags out, open and in a row on my counter, I assemble any ingredients that do not need refrigerating and put those and any necessary utensils out on the counter as well, all before I go shopping. When I get home, I put the meat into the bags, pour in the needed ingredients (sometimes without mixing them elsewhere first), massage the meat, label and freeze. All that in just a few minutes!